ASUS this week introduced the industry’s first gaming laptop powered by AMD’s eight-core Ryzen 7 1700 processor. The ASUS ROG Strix GL702ZC-WB74 is a 17.3” desktop replacement machine that uses the desktop-class CPU and a powerful GPU to offer peak gaming performance to its users. Since the system relies on numerous desktop-class components and an inexpensive FHD display panel, the final pricetag not too high for a gaming notebook, with the laptop launching for $1499. Meanwhile, ASUS will also offer an even more affordable version powered by AMD’s six-core Ryzen 5 1600, as well as a more advanced model with a 120 Hz display panel. To a large degree, the ASUS ROG Strix GL702ZC can be considered to be AMD’s flagship mobile gaming platform, as it supports all of the company’s latest technologies and can scale in terms of performance and pricing to satisfy different requirements and customers. In fact, the ROG Strix GL702ZC is the first all-AMD gaming laptop in years as makers of mobile PCs avoided AMD’s FX-series CPUs due to power consumption and did not use AMD's APUs due for gaming computers because of performance concerns. The notebook relies on a a couple different AMD 65W desktop processors — the six-core Ryzen 5 1600 or the eight-core Ryzen 7 1700 — as well as AMD’s Radeon RX 580 GPU with 4 GB of memory (the manufacturer does not disclose specs of the part, but we are investigating). The graphics processor supports AMD’s FreeSync dynamic refresh rate technology for both internal and external displays. Speaking of displays, ASUS will offer GL702ZC with either 60 Hz or 120 Hz FHD IPS panels, so FreeSync support will be especially handy in the second case. To cool down the two key chips of the notebooks, ASUS uses its Hyper Cool Duo-Copper cooling system featuring heat pipes and two fans that are said to cool down the CPU and GPU independently. Moving on to other internal parts of the ROG Strix GL702ZC. The GL702ZC-WB74 model that ASUS is formally introducing today comes with 16 GB of DDR4 memory, a 256 GB SATA SSD, and a 1 TB hard drive. Meanwhile, more advanced configurations may expand DRAM to 32 GB, upgrade the SSD to 512 GB, and install a 1 TB SSHD or a fast 7200 RPM HDD. By contrast, entry-level configs are going to feature 128 GB SATA SSDs. As for I/O capabilities, the ROG Strix GL702ZC looks like a fairly standard model here. The notebook comes with a GbE port, an 802.11ac Wi-Fi + Bluetooth 4.2 module, three USB 3.0 Type-A connectors, a USB 3.1 Gen 2 Type-C header, an SD card reader, an mDP 1.4 port, an HDMI output, an HD webcam, a TRRS jack and so on. The machine features a Chiclet keyboard with marked WASD keys, 30-key rollover support as well as an isolated numeric pad. With two display outputs, the ROG Strix GL702ZC can handle a couple of external monitors (with FreeSync support), which is okay for a relatively inexpensive gaming machine. In addition, the HDMI port and three USB-A connectors allow users to plug VR headsets to the laptop to play virtual reality games. 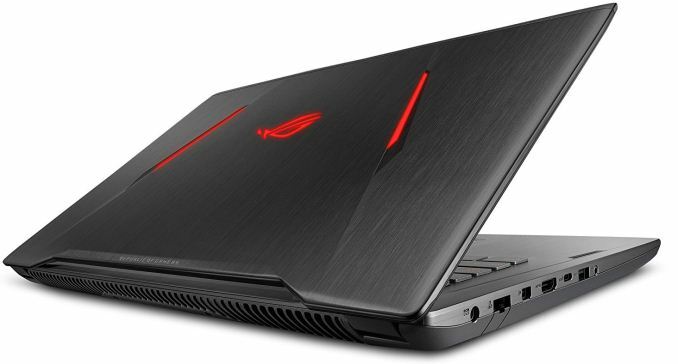 The machine is not as bulky as flagship offerings featuring more advanced GPUs and storage sub-systems But since the ROG Strix GL702ZC is still a desktop replacement laptop, it is rather thick (34 mm) and heavy (3 – 3.2 kilograms). ASUS does not disclose specific battery runtime figures, but a 76 Wh battery should provide enough time do an urgent work while on the go. Dimensions Width 41.5 cm | 16.3"
Depth 28 cm | 11"
Thickness 3.4 cm | 1.33"
The ASUS ROG Strix GL702ZC-WB74 is already available in the U.S. from the ASUS Store, Amazon, and other retailers at an MSRP of $1499. 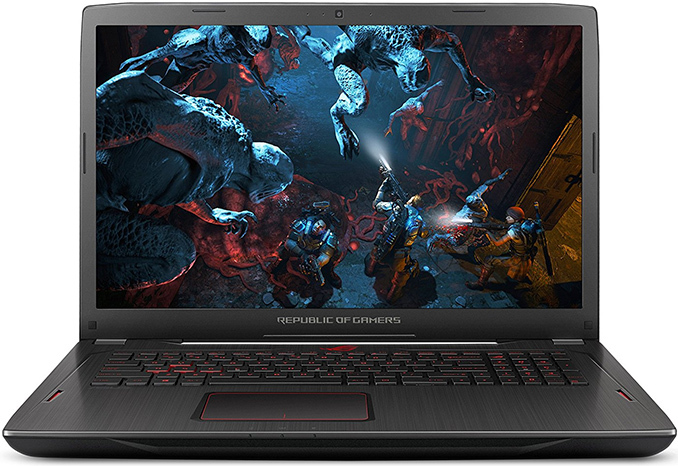 Keeping in mind that we are talking about a notebook based on an eight-core processor (a rather unique feature) and a fairly high-end GPU (for a portable PC), this laptop does not seem to be overpriced. In the meantime, it will be very interesting to see how much ASUS will charge for the lower-end SKU with the Ryzen 5 1600 as well as the higher-end model with a 120 Hz display and a 512 GB SSD. You need to review it Ian. :) You know you do! I'm a bit disappointed that ASUS didn't include an interchangeable DVD-RW drive as well. Also, I have no idea why that's just a SATA SSD and not a more up to date solution. I find no reason for this. Another bizarre thing is the fact that they've used a smaller battery when compare with the other ROG notebooks. I know this makes it a bit lighter, but I would have happily taken those extra 200 grams for an extra hour of battery life despite this being a DTR. The rumors are that the inferior surface temperature on this model is more than 10 degrees Celsius lower than on the other ASUS ROG offerings with Intel's 8core Skylake. The CPU would make sense. It would. Hook up a big pipe (like ROG team does on GPUs) and you get a killer CPU performance. But using one of the most horrible GPUs ever made to power this beast? WHAT WERE THEY THINKING? Freesync needs an AMD GPU so its a great match. Considering that the RX 580 in this laptop is restricted to 68W but still performs pretty much on par with GTX 1060 in actual games, and even surpasses it in some DX12 titles... your statement seems to be one made in ignorance and potential bias. The only reason the RX 580 desktop seems inefficient is because its made on a manuf. process not suited for higher clock speeds. Horrible gpus ever? There is far worse gpus out there bud. Besides you no at this resolution the 580 will tackle any game on ultra at 60 fps. You know how graphics cards work right? Ellesmere on that 14nm process actually becomes WAY more efficient with lower clocks/voltages. You're basing your statement (which was a bit silly to start with) on desktop cards (mostly non-reference) where power is a secondary concern to things like cost:performance. Also, they are using binned chips.